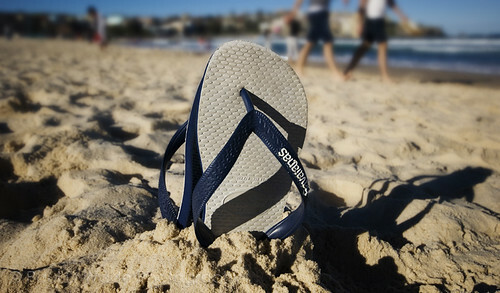 Now the middle of August isn’t normally the time of year to be heading to the beach in Sydney. But it was an unseasonably 26°C on my birthday so my mate Marc and I headed to Tamarama for a couple of hours in the afternoon. Despite being here almost 5 years it was the first time I’d ever been there, though I’d heard lots of good things about it. Tamarama is a small bay beach between two of the larger and more well known beaches in the Sydney’s Eastern Beaches; Bondi and Bronte. It has often been known by the nickname ‘Glamarama’ as it attracts the beautiful people and the gays, so why I hadn’t been there before I’m not quite sure. It was a great way to spend a couple of hours of the birthday and a nice way to relax before the evening’s drinks and dinner. Not quite warm enough to be getting in the water but as you can see from above some were braver. Check the set for the rest of the photos. Last Sunday was another sunny winter’s day and I hadn’t been down to Bondi for a while so jumped on the scooter and went down for a stroll. It’s still not quite warm enough for many to venture into the sea other than the surfers, but in the sun it was t-shirt weather. I wandered around part of the Bondi to Bronte walk taking photos back toward Bondi on the way. I also took the opportunity to try out my new Sigma 10-20mm Ultra Wide Zoom lens, it’s great for landscapes and with the polariser filter the colours just look fantastic (if I say so myself!). Here’s to heading back to the beach in summer…..go take a look at the full set of photos.